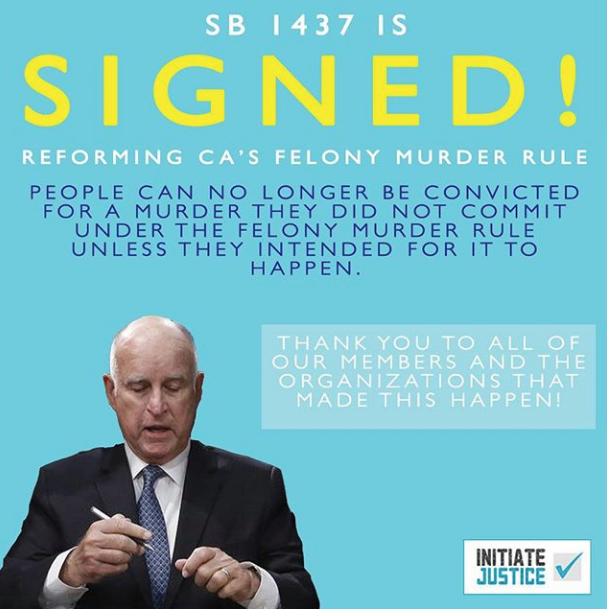 SB 1437: Repeal Felony Murder Rule PASSED! Check out this great re-sentencing guide created by our friends at Restore Justice. SB 1437: introduced by Senator Skinner and Senator Anderson, is a follow up to SCR 48 and limits the felony murder rule. This bill says that a person is liable for murder only if “1) The person personally committed the homicidal act, 2) The person acted with premeditated intent to aid and abet an act wherein a death would occur, or 3) The person was a major participant in the underlying felony and acted with reckless indifference to human life.” This bill unfortunately does not apply to people with “special circumstances” because that would require a 2/3 majority vote. SB 1437 passed on 8/30/18 in the CA Senate with a 27-10 vote. The bill will go into effect January 1st, 2019, and is retroactive! This bill was Initiate Justice’s first co-sponsored bill to pass, and we are extremely proud that we were able to fight to make this bill retroactive for our members unfairly affected by the felony murder rule.